"This is a favorite for everyone I feed it to. If you are trying to get away from carbs, you will be amazed at how much you will love this. My friends stated that this was better than actual rice." Heat 1 tablespoon oil in a skillet over medium heat; cook and stir egg mixture until scrambled and cooked through, about 5 minutes. Remove skillet from heat. Heat 1 tablespoon oil in a wok or large, deep skillet over medium heat; cook and stir chicken until almost cooked through, 5 to 10 minutes. Add bacon; cook and stir until bacon is browned and chicken is no longer pink in the center, 5 to 10 minutes more. Mix peas and carrots into chicken mixture; cook and stir until warmed, about 5 minutes. Add cauliflower, scrambled eggs, and soy sauce; cook and stir until cauliflower is tender, about 10 minutes more. 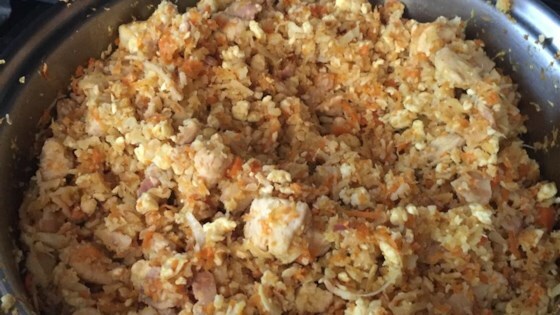 Healthy spin on a classic fried rice dish! In place of chicken, I sometimes use fajita-style grilled chicken that is already cooked. If you choose to do this, add it when adding the peas and carrots. You can use fewer eggs. I just like a lot of egg in mine. My low carb -eating family is crazy for this recipe. I make it twice weekly. I like it too and I don't like cauliflower. Who knew?